What does 2017 look like for Wahoo? [22:17] (We recorded this prior to the Bolt cycling computer being released). Jonathan Lee - Trainer Road - interview coming soon! Thank you for listening, I really appreciate your valuable time. Don't forget to sign up for The Bulletin and my free e-book - "Essential tools, tips and advice to make you more efficient and productive." If you enjoyed this episode, please let someone know - send them a message or email or tweet about the show. You can share this episode easily by clicking the share link at the top of the page. Thank you! Also, please leave an honest review for the Remarkable Business Show on iTunes or Stitcher. Ratings and reviews are super-helpful and they make a HUGE difference for the show viability. Anything you write, I promise I will read. [00:00:04] Cyclist, skier, international fugitive and all around curious guy, here's the latest edition of the remarkable business podcast with your host Jon Moss. 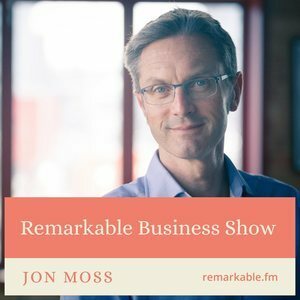 Jon: [00:00:20] Welcome to the remarkable business podcast. I'm your host Jon Moss and for those of you on Twitter you can follow me at Jon Moss and Jon with no H and I am also not the football referee. Oh my god I get some abuse when he's refereeing games. So what am I doing here. Standing in a wonderful recording facility. Well I've been wanting to do a podcast for many years and finally I've got around to getting this up and running and I wouldn't be here without the wonderful help that Howard at Engine 7 is providing. Now those of you who don't know Howard he's an incredibly nice guy and extremely talented and has been doing sound design and audio post production for many years. I would encourage you to check out his details at Engine 7 that's the numeral 7 .co.uk. So thank you Howard for all your help advice and expertise. Jon: [00:01:16] So a podcast. There are thousands of podcasts on the Internet right now. So what is this one going to be about. Well I'm going to be doing around one podcast per month, possibly a little bit more frequently focused around the topic of Remarkable Business. I already have some superb interviews recorded with guests from around the world and they're from a wide variety of businesses and sectors but all with one thing in common, they're doing something remarkable, they're standing out, there challenging that disrupting and making a real success with what they are doing. And I guarantee that whatever sector you're in you'll be able to learn something from them and find that they are an interesting person to listen to. Jon: [00:02:00] So unashamedly they're going to be some tech people or some cycling people travel design and also coffee related topics and interviews and I guess I've got a real love and have a real affinity with these kind of things and hence you know I know quite a few people in their sectors. I'm also going to be talking about what's going on in the marketing, the web, productivity world and discussing things that I think you're going to find of interest. If some things caught my eye during the month and made me smile and think you guys are going to like this. I'm probably going to mention it and we can talk about it. Jon: [00:02:33] The first guess I'd like to welcome to the podcast is Kevin ABT. Kevin is the head of international sales and marketing of a wonderful company called Wahoo fitness. For those of you into cycling you've probably heard of these guys. They are responsible for single handedly shaking up the turbo trainer market with the launch of the Kickr. They also have a cycling computer Element which is a challenger to Garmin and other brands and have recently released the updated version called the Bolt and having used both a Kickr and the Elemnt. I can say without reservation they are super products. Jon: [00:03:05] One of the subjects we do cover is the importance of the smartphone to non-tech sectors and especially how it has influence cycling. We also have a chat about brands that he admires and I'm delighted to say he chose one which I know well and I also think he's doing a fantastic job. Jon: [00:03:22] So we're going to listen to an interview I conducted with Kevin over Skype. So the audio is ok, but we're learning and I'm sure we're going to try and improve over the coming episodes. So just bear with us for the moment. It's not as crystal clear as the wonderful work I'm doing with Howard in the studio. So without further ado is Kevin from Wahoo fitness. Enjoy. 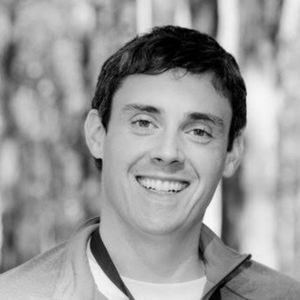 Jon: [00:03:42] So delighted to have Kevin abt from the Wahoo fitness on the podcast today. So welcome Kevin. Kevin: [00:03:50] Great to have you here Jon. I appreciate it. Jon: [00:03:52] You're very welcome. So Kevin is based out in London originally from the U.S. as you can probably detect from a faint accent. So we've got some great stuff to go through today. I think the first question how did Wahoo actually start Kevin? It's a brand that I've been familiar with for many years but only really just bought a couple of things in the last couple of months but I'm super impressed. How did it all come about and how did you join Wahoo? Kevin: [00:04:18] Sure. So the history of the company really starts back in 2010. This is our seventh year and our founder Chip Hawkins who is also we're based in Atlanta Georgia and Chip is based and also in Atlanta started getting into triathlon himself and his experience was unique in the fact that he's a big smartphone iPhone user and he saw people using you know different watches or bike computers that really had no smartphone connectivity and he was confused by that because the smartphone is such a powerful piece of technology it's got built in GPS, it's got the ability to connect to sensors through Bluetooth and it's very easy to use interface in a rich app ecosystem. And what would Chip figured out was why don't we start to create sensors and devices that pair and speak and play nicely with the smartphone through Bluetooth or through Ant+. And it was actually Ant+ that we first started to experiment with. Our first product was what we called the Wahoo key, which is still available now. But but it's definitely a product that has gotten us to help to get us where we are but it's not a key part of our portfolio anymore. But it would plug into the 30 pin connector of an old iPhone 4 or 4s and it would allow for Ant+ sensors like Ant+ heart rate sensors or speeding cadence sensors to connect to an iPhone and it would allow you to get heart rate data into your iPhone or into an app and we started to work with our own app. But we also partnered with the likes of Strava and Endemondo and Cyclemeter and Nike running. Kevin: [00:05:44] And that's how we started to have what we called smartphone connected devices. And from there we started to push more into cycling and start to focus on even more advanced products like indoor bike trainers and bike computers. But everything you see with our device is it's a reoccurring theme. We we play really nice with smartphones and we really leverage the inherent strengths of a smartphone which is a great usability very friendly user interface, from the standpoint that it's a big screen, it's a touch screen, it's a high resolution screen but also the connectivity both to hardware and to the web that a smartphone offers and the app ecosystem just allows for such variety. We never want to tell our customers they can only use the Wahoo app. We really leverage the app ecosystem to work with great partners like Strava, like Nike running but also when it comes to our trainers you know Trainer Road and Zwift. There's so many out there that we can partner with and it really helps to diversify our set of users and give them a variety of different experiences. Jon: [00:06:40] And it seems to be very user experience, very customer focused because you've got to have a good experience straight out of the box with these things and certainly my experience has been very good and all the stuff I'm reading online. That seems to be very strong in terms of you focus on the user. Kevin: [00:06:54] Yeah we really want to wow our customers within the first whatever you want to say 30 seconds of them taking the product out of the box and I think you'll see that a lot with the ease of use of our setup. And that's true for all of our products across the board. We're trying to make this really easy because the last thing we want is for our customer to have to spend 30 minutes, an hour, two hours trying to figure out how to use our product. Time is precious these days and the hardest thing about going on a ride or doing an indoor training session should not be figuring out the technology it should be you actually out there. Jon: [00:07:22] Oh yeah. I had an experience yesterday. The brand will not be mentioned, something set up and we actually gave up in the end and we didn't even get round to reviewing something because the set up was so bad and the experience out of the box yeah we'll forget that one. I'll stay with Wahoo for the time being. Jon: [00:07:40] Prior to any conversation with you guys are really getting involved with Turbo Bike Trainer, I bought a Kickr version 2 at the beginning of December. I've been using it with Zwift it and also Trainer Road and at this point big shout out to Jonathan at Trainer Road who has been super helpful, so thank you Jonathan. Jon: [00:07:58] How did Kickr come about. And also it would be interesting for people to know about what's the difference between Gen 1 and now generation 2. Kevin: [00:08:06] Sure. So we actually first announced and made the Kickr public it was at Eurobike 2012. Jon: [00:08:12] Wow. So a few years ago. Kevin: [00:08:14] Yeah it was announced then but it didn't start to go on sale until mid March 2013, the original Kickr and we were the first company, again no surprise here, that took a very smartphone-centric approach. We developed, our engineers developed a Bluetooth Smart two way control profile which allowed for, through bluetooth a smartphone to send a signal to a trainer to change resistance. But also for that trainer to send signals back to the smartphone to let them know hey, this is what my power is at. Here's my speed, here's my distance and it was that connectivity through the smartphone through an open app ecosystem that really allowed for third party app developers to come in and create amazing experiences which has happened and that's what we really pioneered. The other piece we really put a lot of effort into creating a wheel off trainer a lot of trainers not all them but a lot of trainers to that point where we're we'll on trainers but wheel off provides a much more realistic road feel and to supplement tha our engineers took a very flywheel centric approach you'll see on our Kickr but also on our Kickr Snap a very heavy flywheel that really provides that realistic road feel and that sense of inertia. When you start to pedal and also after you're pedaling for a while and you're coasting. It's very natural and that's really important to us. Jon: [00:09:22] I noticed the weight of the flywheel taking out the Kickr from the box. I'm not blessed with the biggest guns in the world. Then I set my riding buddies. Harsh but fairly call my arms Twiglets. But yeah I was struggling to move the thing. I mean it's a solid bit of kit. Kevin: [00:09:38] Yeah that was important. I mean that's true with the current version of the Kickr or the previous version and also the Kickr Snap. We're not shy to make very heavy, sturdy products. They're made out of steel. We're proud of the construction. You know some other trainers out there tend to be a little bit focused on plastic as one of their key components and I do think there's a tradeoff there for durability and stability. We don't think that's worth it. We go with steel. It's heavy can be challenging to move around. But you know hey you've got to work out your arms just as much as your legs right. Jon: [00:10:02] Good point. I'd absolutely emphasise that certainly the quality is immediately apparent. You want something to last these days don't you. It makes a big difference. What's the main difference between Gen1 and Gen2? Kevin: [00:10:13] Sure is. It was definitely an evolution. It was a complete redo the product. We're fortunate we took a lot of time to make the first one and I think we got a lot of things right. But for the second one we did a couple of things in no particular order here. The first thing we did was speaking of the weight, the new one has an ergonomic handle to make it easier to move around. It's much better balanced in that sense and it's a small change but it's actually a very useful utilitarian change that makes a difference. So that's one. The second one is just from a visual perspective to know when it's plugged in and poweredand also when it's connected through Bluetooth or Ant+ we have some LCD indicator lights there. Jon: [00:10:45] They work really well. I like the blue. Blue lights are good, blue lights are good! Kevin: [00:10:50] Yeah it's a simple enhancement but it does help. Again we're trying to focus on an ease of use and increasing the speed at which you can quickly get up and running. Other enhancements we work closely with the team at Zwift, which is one of our top app partners to optimize the Kickr's responsiveness to changes in Zwift terrain. We really want to make sure that if you're on Zwift and you see that gradient changing and going up 1 2 3 3.5 percent that signal is being immediately sent to the Kickr and the Kickr is immediately making a change to the resistance to replicate that terrain change. So we've worked on some code behind the scenes to do a firmware update and to improve the speed at which Zwift and the Kickr are communicating with each other to make sure that change in resistance, that change in terrain is felt as immediate as possible. Kevin: [00:11:33] And we also made some enhancements to lower the decibel level of the new Kickr. You know the Kickr is as I mentioned it has a flywheel and it's also a belt driven trainer. When you look at it compared to some of our competitors it's clear that there's a belt and that's the way that the engineering was developed on the Kickr and that's again something that's unique for us. So naturally it does create some noise, but we did some improvements to make some slight adjustments to the tension of the belt and also reduce some friction points on the flywheel to make it a bit quieter. So those were those are the big changes that we really focused on and again at the systems built with an open API. So that means as new app developers come into the market we have our API publicly published on our site. We have a team of engineers on the software side that help new app developers. They have any questions on integration. So the products almost future proof in that sense as new apps come along like Zwift did two years ago. We immediately are able to work with them and it does not require our customers to buy a new unit or to pay for some sort of upgrade is naturally built into it and the app developers out there just pop in our API to their to their programming and they can be up and running really quickly. Jon: [00:12:32] That's great to hear. I'd certainly echo your comments around the responsiveness of Zwift and Trainer Road. It's been a great experience. Jon: [00:12:40] We talked about Kickr but one of the less well known products for Wahoo is the Elemnt, the cycling computer. Got one of these in my hand right now. I'm super impressed. Can you just tell me a little bit more around that. Kevin: [00:12:53] Sure. This also speaks to Wahoo who has a brand as a challenger brand is trying to accomplish. So we really view ourselves as cycling tech - a startup that can complete a really interesting circle here. If you think about what a cyclist needs today especially with the rise of indoor smart training. They needs tools for the indoors and also for the outdoors. And we had such great luck with the Kickr and the Kickr Snap but we looked at what our customers needed and they really also need something when they're out on the road and that's where the computer comes in and having the opportunity to have a very rich ecosystem of indoor and outdoor technology. So bike computers is a big focus for Wahoo as a brand you're going to see a lot more in that category as we move forward. Kevin: [00:13:27] The Elemnt was really taken with a simple approach. How do we make using a computer setting up a computer. The easiest part of your ride not the hardest and there's some experiences out there I've heard from customers that have used other products where set up can take 30 minutes, an hour. There's a booklet that you need to read. There's menus that you have to scroll through and it just takes a while. So what we've done with the Elemnt again which is classic Wahoo here taking a very smartphone centric approach. And Jon you probably noticed when you took the Elemnt out of the box and turned it on one of the first things that hits you is that it's a QR code on the screen for the Elemnt and you take your smartphone, iPhone or Android and download the Elemnt companion app which is a free app and you can use the app in your phone camera to scan that QR code and immediately you have the two devices synced - really simple to do. They're communicating behind the scenes through Bluetooth and what you'll see with that Elemnt companion app is all of the setup and the configuration of your pages of your pairing of your sensors of linking your Strava account or your Trainer Road account or your Ride With GPS account is all done through the phone. And again the phone's interface Apple and Android have to spend so much money on creating elegant touch screen interfaces with large rich graphics. A great app ecosystem. Instead of fighting it we leverage it. We take advantage of what those guys have done and we play really nice with the smartphone and the Elemnt is a standalone GPS device so you configure it with your phone. But then you can take your phone and leave it at home, put the Elemnt on your handlebars and off you go and then it's a standalone device with great battery life but it really does play nicely with the phone and that unlocks some features and some usability which I think has been lacking in the traditional GPS bike computer market. Jon: [00:14:59] I absolutely agree... the unboxing experience is lovely. Reminds me a little bit of Apple. It was just really nice to actually pull out the device. The packaging itself is well done. Shows you exactly what it can do and you are right. I downloaded the app the Elemnt companion app and paired it and I was off and running in literally probably under two minutes. I mean it was staggeringly good. And also you know just being able to configure everything from the screens, the Strava set up and the data - that was terrific. Kevin: [00:15:34] Yeah so you know that's something that we really wanted to focus on. Not everyone uses their computer for deep navigation but it's nice to know that it's there and making it easy I think is a big focus. So we've done again with that Elemnt companion app. We created a feature called "take me anywhere" which allows you within the app to have a map that pops up. We leverage Open Street Maps and you have the ability to do a couple of things you can just type in an address or you can type in a location like coffee shop or bar or a gas station or you could take your finger and just drop a pin on the map. And what happens is the app will automatically create a cycling friendly route from where you are to that location of choice. You can then say send to the Elemnt and again through Bluetooth the phone will send that route to your Elemnt, including the turn by turn directions or that route. At that point it's saved in the hard drive of the Elemnt. You can take your phone and you can leave it at home or put it in your back pocket that's fine. But it's all built into that Elemnt at that point. Start your ride and off you go with turn by turn navigation and you know it's a nice feature when you're out there and you might be in the middle of a ride and you need to do a quick detour to take up the companion app and reroute yourself and again it's done in a very elegant way leveraging the smartphone interface using the ability to you know pinch a map to zoom in and zoom out all those features you're used to with using Google Maps or Apple Maps. It's leveraging that same sort of interface because the smartphone is just so powerful in that sense. Jon: [00:16:53] That sounds very cool. I don't know of any other product that does that? Kevin: [00:16:57] Yeah I haven't seen that either and again I think this is important you know with Wahoo being a challenger brand we are taking a big step backwards in saying how do we do things different not just in the initial experience and the look and feel but also with these key features that make using a bike computers so much easier and frankly a little bit more I would say in tune with how people are used to interacting with devices smartphones. You know we can leverage that smartphone. It's just natural. So I haven't seen anyone else doing that either. There's a handful of companies that make great by computers and they have rich heritage and GPS and navigation but I don't think you'll see them leverage the smartphone as well as we have. And that's a key piece to this. Jon: [00:17:33] I absolutely agree with that and I think the other two things stand out for me. Having used for you know a couple of rides of looking forward to riding with this weekend is just the clarity of the screen, the zoom ability as well for people who haven't seen an Elemnt, you can just zoom in and out. The actual data so you not having to set up multiple pages to show multiple fields of data you can just zoom in and out really easily. That was a really big thing for me and people I ride with - that was something that caught their eye straightaway and then the LEDs as well there's a number of these on the site and the top of the device. Kevin: [00:18:06] Yeah we've done a handful of things with the LEDs and I think it started off as something that was really in many ways a safety feature because when you think about the power of multi-color LED's to be caught out of the corner of your eye to give you indications on turn by turn navigation. Those LEDs will be used as a flashing signal. So if you have a right hand turn coming up those LED's will start to flash to the right or to the left and you'll see that out of the corner of your eyes you can keep your eyes on the road and focus on safety as opposed to trying to look at the specifics of all the details on the bike computer at all times. But the LEDs are also used for heart rate training and power zones. So the Elemnt through Bluetooth or Ant+ pairs to any Wahoo or third party sensor. So if you have a heart rate sensor or power meter you can see your heart rate zones based on what you've programmed into the apps are the colors that correspond to different heart rate zones the same thing with power. And the final thing with the LEDs anyone who's a big Srava user and is a big fan of Strava segments. We have built in Strava segments integration those LEDs will flash Strava orange as you approach the Stava segment and they'll give you indications as far as how far you along that Strava segment beginning or end and also are you above at or below what you're racing against, be it a PR or K.O.M. So we've done some creative things there and again it's I mean you're not seeing in other devices. Jon: [00:19:18] Yeah sure. I set it up so I was monitoring my average speed. So it was the white LED on the left hand side. So it was like we were doing average speed. And when we went faster it was blue.When we went slower, it was yellow. That was really good when we hit the climb my less fit buddies were behind us. I said "come on guys. We are on yellow. We need to up the pace here. Jon: [00:19:39] I'm super impressed with the Elemnt. Certainly I think you're absolutely right it's doing different things really well. Big big thumbs up for me so far. Jon: [00:19:47] Just Sky - big cycling team that you guys support those guys a lot with them. They're all using Kickrs I think if I remember rightly? Kevin: [00:19:56] You're correct. So they've been using Kickrs for the last three years. And in September of 2016 we reupped our relationship with them for another two. So it's now becoming more of a longstanding legacy of us working with Team Sky and obviously over the last three years performed quite well. So it's again you know for us, we are young brand, we have to stay focused. We wanted to work with a team that was very much focused on using technology, the best technology to make small improvements the marginal gains that they believe in and we agreed with that approach. So it's been a good solid relationship and you know we work closely with them. Our founder Chip Hawkins is a great relationship with the team and you know Chip is our founder and CEO, but he's also in many ways our Chief Technology Officer / Chief Product Development Officer and he's working closely with those guys behind the scenes to make tweaks and to make improvements and you know I think you'll hopefully we'll see more of that going forward and how we can enhance the experience not just for Team Sky but also to make sure those improvements get into the hands of our customers. Jon: [00:20:53] That makes all the difference doesn't it you know. You know arguably the best team in the world is just great to have those professionals people like Froome and what have you using it on a daily basis. So, we sitting at home with the trainer setup in the garage or the kitchen are seeing those benefits. Really really good. Jon: [00:21:10] So just a couple of last questions. Yes Kevin. So slightly outside of cycling or it could be within the cycling fraternity are there any brands whether that's a product or service really impressing you. I'm a big lover of brands, you know challenge brands as well. So it's great to hear what you guys are doing. But is anything you've sort of seen you got your eyes on you think wow they're doing some good stuff? Kevin: [00:21:31] Sure. So I've got a new one so I grew up in Connecticut in the U.S. in an area of the country called New England. So there is a Boston based company called Tracksmith which has been around for a little bit and I really do. You know I've been in turn onto their products recently. Again this is running it's a running brand but it really is it's very focused. When I look at their experience on social when I look at their products when I look at their website it's just very raw and focused. There's no clutter here it's not trying to serve every single runner in the world which is something maybe that you know the bigger brands like Nike are Under Armour try to do in their own way. I think these guys are very much focused on the performance but also not trying to overdo it with complex technology or gimmicky. I don't know features. It's really almost no nonsense using natural fabrics and components. But again a premium brand. I think they know exactly who their customer is and they're speaking to them in a great way. And I've found them really engaging and inspirational so you know there's so many great brands out there. But for one especially since it's from my backyard I appreciate what they're doing. Jon: [00:22:26] I am a customer of Tracksmith! Kevin: [00:22:29] Oh good, ok! Jon: [00:22:30] For those of you who may not have heard of Tracksmith, check out Tracksmith.com. Yeah, a beautiful aesthetic I think in terms of the goods that they're producing and have got a few of their bits and bobs... Sadly not available in the UK. You have to order from the states and keep on emailing them saying when's the UK distibutor coming. Yeah I totally agree. Great brand. Jon: [00:22:49] Last but not least. What does 2017 look like for Wahoo? Kevin: [00:22:53] Sure. So I think you're going to see more innovation for us around that ecosystem of indoor and outdoor cycling tech. We think there's a lot more we can do in the bike computer space I think with the Elemnt. We had a nice initial step forward but there's more that we can do to complete that family to build out that storyline and to make sure we're serving cyclists that a variety for key feature set. So look for us to push more there and I think there's also more that we can do around continuing to innovate in the indoor trainer space that's still a main part of our business and there's a lot more upside that we can do there. Jon: [00:23:23] That's great. Kevin thank you so much for coming on today. I really appreciate your time. Thanks again. Kevin: [00:23:28] Of course no problem Jon I appreciate it. VO: [00:23:30] This edition is brought to you by the terrific folks at Baron Fig. Jon: [00:23:37] I'm delighted to say that every episode that we are going to be doing has got a fantastic sponsor and as just mentioned this episode is sponsored by the amazing guys and gals over at Baron Fig. Jon: [00:23:51] Now Baron Fig you might be thinking is this food brand? What sort of things do you do? Well head on over to Baronfig.com and have a look. They do some wonderful notebooks, pens and pencils they're beautifully made and have a number to choose from. My favorite is the Confidant which is now available in three sizes and is hardbound and this is absolutely perfect for journaling and just jotting stuff down but it really does make a very nice looking companion to your favorite pen or pencil. Jon: [00:24:21] If you head on over to the and to theappleofmyi.com/newsletter and the appleofmyi is the letter i and not eye, you can sign up for my regular newsletter and the good news is that are going to get into a draw to win some wonderful Baron Fig goodies and you'll also get my e-book sent to you. I cover a load of topics such as morning routines, software I use, health and supplements and anything that's made a significant improvement in my life. Jon: [00:24:52] Just head on over to theappleofmyi.com/newsletter and sign up. Jon: [00:24:58] Last but not least hell has indeed frozen over. I've been using an Android phone now for about four months. I've got a few thoughts on how it compares to a decade of iPhone worship. Jon: [00:25:09] For those of you don't know I was in the queue at the Sheffield Apple store in 2007 - number one in the queue ready to get an iPhone so I was one of the first people in the UK to actually have one of those bad boys. I've had an iPhone ever since. So the Android phone I decided on was a OnePlys 3T and four months into ownership, I'm incredibly impressed. There's a number of things that are really sort of struck me as equal to the iPhone or certainly better than an iPhone. I think design is one of them. It certainly feels fantastic when you're actually holding it. And I've just got a simple OnePLus case around it. Also the features, the battery is fantastic. They have something called dash charge so you can get a full charge in 45 minutes. The camera's pretty good. Probably not quite as good as the iPhone but certainly very serviceable. The pricing about half compared to an iPhone. I think the iPhone 7 - 700 pounds I think I paid and the OnePlus 3T is three hundred ninety nine so pretty darn good and that's unlocked. it also has a dual SIM card. If you are traveling abroad you can have an extra SIM in there and that's a really nice feature. The OS is Android Nougat or Nougat - however you want to pronounce that. There is so much that you can do in terms of customization and it can be a little bit overwhelming. I'm missing a few apps when I'm using the Android device. Probably Tweetbot and Reeder. Those are the ones that I think I'm missing the most. I'm always on the search for recommendations. Jon: [00:26:37] So as well as the apps that I'm missing the big question is would I go without the iPhone. I think I probably would. It's something that I'm going to be trialing over the next couple of months. I'm going to try and go iPhone-less for a few weeks and I'll be reporting back on how I get on. Jon: [00:26:52] I've also written up my detailed thoughts around the OnePlus 3T and how it compares to the iPhone over on Medium. I'm going to be writing a lot more on Medium in the future and you can find me at medium.com/@jonmoss. That's J o n M o s s. Don't forget to click follow! VO: [00:27:11] Don't waste a single day. Do great things with awesome people. Life is short. Make every day count. The Remarkable Business Podcast. 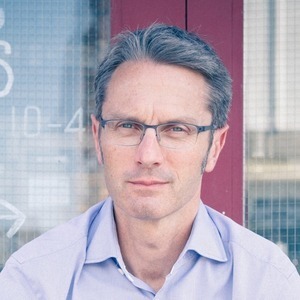 Jon: [00:27:45] All that remains is to say thank you very very much for listening and I look forward to welcoming you back for the next edition of the Remarkable Business podcast. Catch you soon. Engine 7 Audio Production — Engine 7 - powering the Remarkable Business Show!